Life In Monkeyland: Ah Nataliisms- "Island of Love"
Ah Nataliisms- "Island of Love"
Not unlike myself, our living room furniture is on the chunky side. Also, like me, it puts the omf in comfy. After I finally got the ex to vacate the last dwelling, eldest monkey asked if we could rearrange the living room. Slightly odd request for a two year old, but my monkeys and I are slightly odd. So, I left the big ole wompin' couch where it was and pulled the loveseat to the center of the room. Then, I pulled the chaise lounge thingie (which just sat in a corner usually as yeah, I'm not the hoity toity loungie thing type) up against the loveseat until it formed a ginormous square roughly the size of a queen size bed. 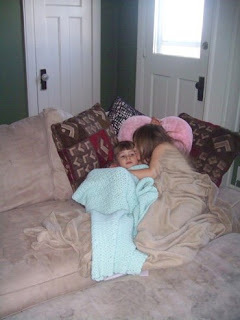 We then all piled on it and snuggled down to watch The Muppet Movie. During the opening Rainbow Connection, the edlest one and I decided to name our new creation "The Island of Love." It seemed quite fitting. The Island of Love has since moved with us. Guests that visit for the first time look at us with a mixture of confusion and "wow, they really are kinda nuts" until they park their judgmental tushies on it and feel the love. I fear a day when it will have to be separated. No matter how crazy or rough our lives get, The Island of Love is our safe haven. It's our fortress of fun, our wealth of woobiness, our sanctuary of snuggle, our lush landing of love. And we, as you know, are all about the love. This pic is giving me a warm & fuzzy feeling.